Lothlorien’s approach to mental health is based on Tara Rokpa Therapy which was developed by Dr Akong Rinpoche, the founder of Rokpa Trust. This form of therapy brings together Buddhist understandings of the human mind with relevant western psychotherapies. As the growing popularity of mindfulness based approaches demonstrates, many healthcare professionals and others are showing an interest in eastern ways of working with the mind. At Lothlorien we cultivate the principle that the human mind carries its own dignity and healing capacity which cannot be permanently damaged or destroyed. We believe that it is possible to get to know this innate capacity which we all have, and is most obviously expressed in moments of relaxed openness. In times of difficulty, however, the more usual response of the body and mind is to tighten and to solidly identify with our experience, hence seeing little choice or ways out of our difficulties. When the mind is more relaxed, creative solutions are easier to find, especially when one is able to access the natural open quality of mind. No-one is a stranger to momentary experiences of calmness, stillness and tranquillity. However, for more calm states of mind to become a stable part of our day to day experiencing relaxation and awareness practices are generally thought to be helpful. 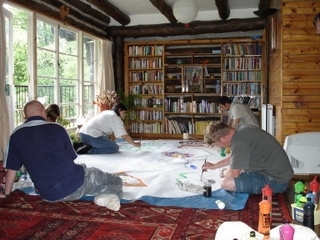 The therapeutic sessions which are offered at Lothlorien have their foundations in this approach. Relaxation sessions, based on Tara Rokpa Therapy methods, are offered three times a week at Lothlorien. These comprise of breathing exercises, awareness of body sensations and simple visualisations. All of these methods are used as a way of developing broader understandings and cultivating compassion towards self and others. 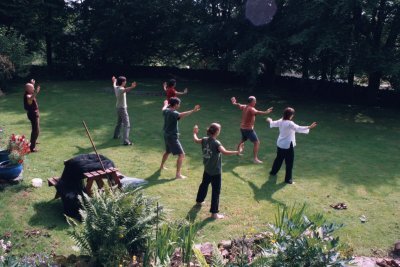 Qigong (pronouced ‘chee gong’) consists of sets of gentle exercises which are designed to promote health and vitality. It is closely related to Tai Chi. We do a 20 minute session of Qigong three mornings a week which we have learned from teachers from the Seven Stars School of Taijiquan.